A lucky player from Germany has just grabbed this first big win of 2018 at Casumo Casino. The online casino announced their first winner of the year pocketing a very cool €214,717 jackpot on one of NetEnt’s popular online slots. In addition to that Casumo are also hosting a special race where you could be the proud winner of €2000. Once again, it’s NetEnt’s jackpot slots highlighting the news, this time it’s their Hall of Gods Slot at Casumo Casino. A lucky German cashed out almost €215K and all that from a mere €1.20 bet rocketing himself straight into 2018 in style. 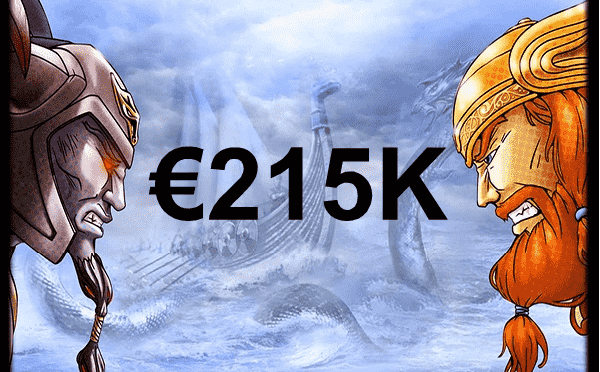 A lucky German wins almost €215K playing Hall of Gods at Casumo Casino. The player was at home at the time on just another ordinary day when the struck the lucky win. He’d been playing at Casumo since December 2017 and admitted to the casino his favourite game was actually the Book of Dead Slot. However, on this particular day the player decided to give Hall of Gods a spin considering the game is currently approaching a whopping €3 million. Lucky for the player his decision certainly paid off. The player has so far kept the win quiet and also told the casino “I didn’t tell anyone yet. But for sure, I’ll go out celebrating on the weekend.” We’d just like to send massive congratulations to the lucky player from the team at Casinosss. Now, if you’d like to get involved at Casumo Casino there is certainly plenty to keep your entertained including their Promoted Reel Race Main Event. Take part in the main event and win €2,000 in prize money. You’ll also find full terms and conditions over on the website. Good luck.